Have you ever found a great deal at Ross Dress for Less? p.s. I was featured on The Ultimate Life Style Blog. Please go check it out. I love it so much! Kiah, I LOVE this. So cute and refreshing. And talk about a steal! Cute dress! Shoo...I would've done the same thing. Actually, I have done the same thing! Ross can do that to ya. The one around my way stays crowded. I haven't been inside the store for almost a year because of this. OMG!!! 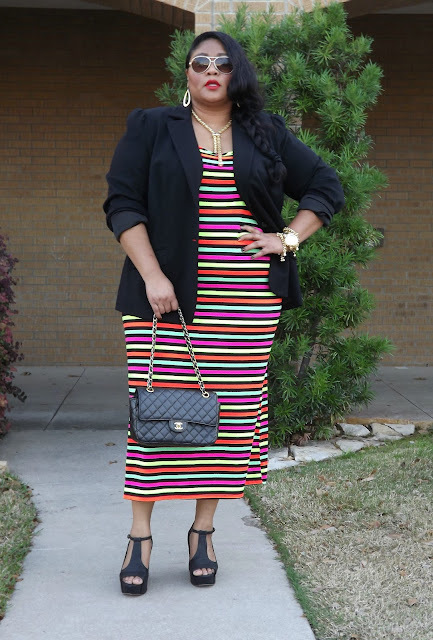 That color-striped dress is too cute!! I'm so jello over it. I want one!! Great pick!!! And i love your style and blog!! I've gone in to Ross and come out with four dresses for a total of $25 or less. They're always worth checking out, especially for dresses. Love this one on you. It has trendy neon elements without looking like it's trying too hard. You look great!! Wow you got the deal of the year! This dress screams spring! You are working it! I know it's been forever.. am working and travelling through New Zealand so I don't get to go on the internet every day. Hope you've been doing well! The queen of colors I swear! I love Ross so much! but I LOVE the dress.....I want a short one! Always in awe of you style. I have found great deals there but I always go on a random during the week day to avoid crowds. YOu look haute! Love this dress!! Very cute!! I don't think we have a Ross here in MN, but I'm sure gonna look!! Love the dress, totally worth the time to get it. Great price and styling is perfection. What a fun dress to wear!! I'm in love with the neon colors! I know exactly what you mean about standing in line for 15 minutes but the price was amazing!!! Oh I am LOVING this dress!!! I need to swing by a local Ross and see if I can find one for ME! i love ross and you look FAB!!! the colors are perfect!!! Can I just tell you that the life you are giving me in this dress is beyond the scope of reason? I love these colorful stripes on you. Adding the blazer and classic accessories is the perfect touch. The JCs only add to the funky eclectic appeal of the look. So when can we go shopping together? You find amazing items at great prices. Truly a fashionista! This is why I love Ross soooo much! This dress is AWESOME! People always ask me why I like that store so much....because it never disappoints! You look great per usual! Very nice dress. Love your shoes. I love Ross. I haven't been in a long time but they have some amazing deals. That dress is awesome. Gotta LOVE Ross... $10.99!!!!!! It was worth those 15 minutes!!!! I love your blog and your style!!! i'm your new follower!! I finally got to the post office today to mail your necklace. I am sorry I am so tardy in doing so. You look so lovely in this dress. I like the bright stripes. We are supposed to get a Ross store here, but I am not sure when it will open. Gorgeous dress!!! It was so worth the wait!!!! I'm so glad you got that because it looks so perfect on you, it's spectacular! I love Ross's home goods section, it has some pretty snazzy stuff! Love this dress! Super cute!!! I just put in work at Ross this weekend too! 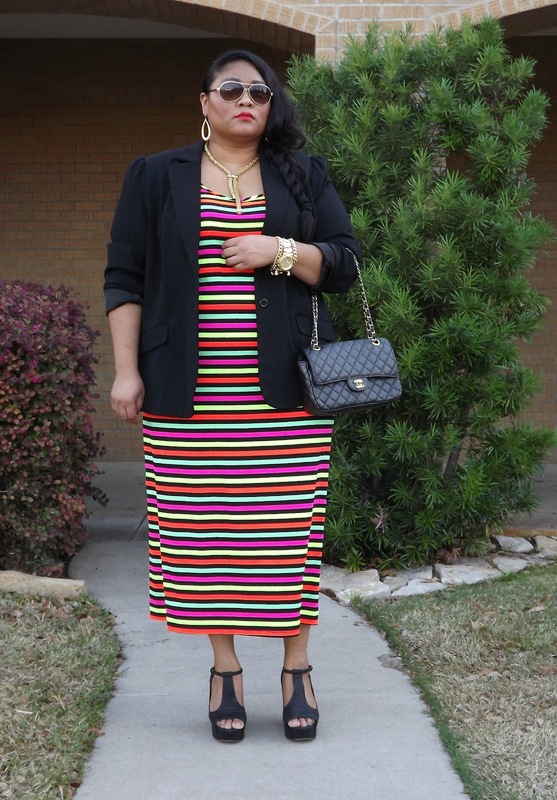 I picked an awesome striped maxi too for $9, can't beat that at all. 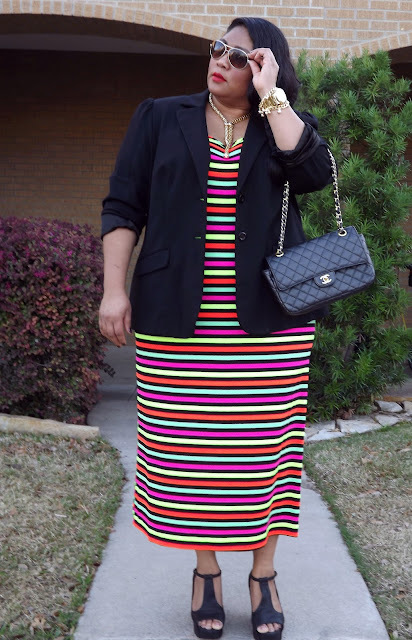 great dress, loving the neon colors in it. AAAHHH! THAT DRESS! I love it so! I wanted to extend an invite to an event that will be here in Houston. It will be a much smaller version of Keren Charles from Two Stylish Kays Swapnista. I will send you the details when I have them. It feels a little repetitive but you are sooo creative Kiah, I love it!! !Only u can come up with neon spripes, two of my favorites at the moment. J'adore! Sooooo basically...I need this entire outfit! You look amazing! Umm ma'am you did this look right here effortlessly but coming off like you are the bomb (which you are). Love you!